It's been a long time since I have done a blush post, so I felt it was finally time to do one. 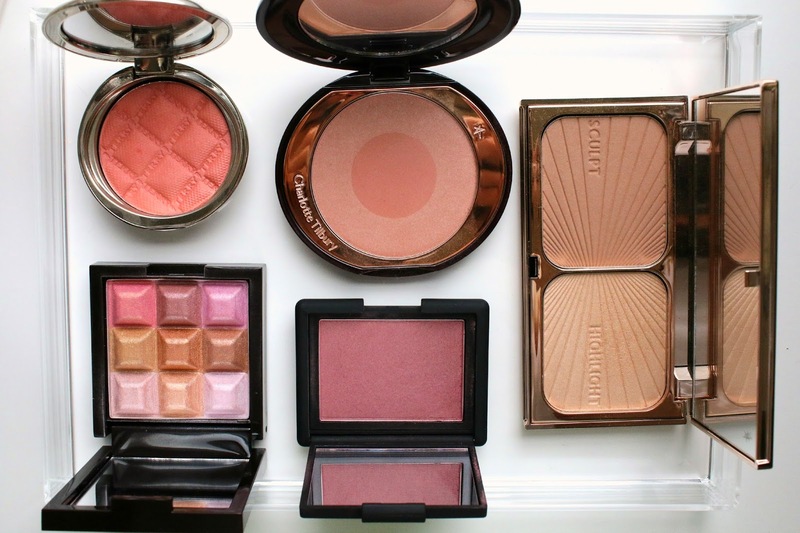 I tend to keep the same blushes in rotation for weeks at a time, and here is a look at the ones I've been wearing regularly this fall. 1. Charlotte Tilbury Cheek to Chic in First Love - I was not excited about this color when I first saw it because it seemed so dull and drab, but it's become one of my favorite neutral blushes that goes with any and every eye/lip combo I put together. That is the sign of a good blush, amiright? I like swirling the colors together rather than using them separately and find that it gives me a nice rosy flush without appearing too ruddy or boring. Available at Nordstrom and Bergdorf Goodman. 2. NARS Blush in Sin - It's taken me a long time to finally try this cult classic color, but I am happy to join the party at last. The color looks a bit too deep for my pale skin in the pan, but after I dust it on my cheeks, it imparts the most beautiful plum-gold color which is perfect for the colder weather. I love wearing this when I have a dark, vampy lip and tons of mascara. But as with most NARS products, a light hand is essential and it's always better to start small and build as needed. No clown cheeks here, thank you very much. Available at Sephora, Nordstrom, Saks and Bloomingdale's. 3. 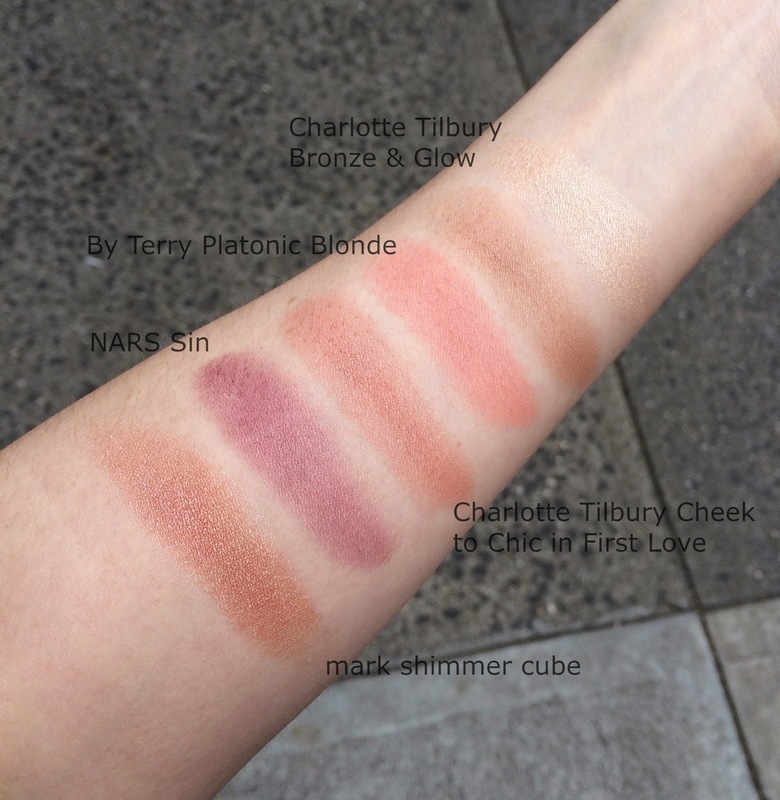 By Terry Densiliss Blush in Platonic Blonde - Never has I met a blush that felt smoother and more silky in my life. I have a lot of blushes in my collection, and even more that I always think are the smoothest - but now I can definitively say that this By Terry Densiliss formula wins over all of them. It feels so delicate, yet packs quite a punch when applied. The powder disperses evenly on the cheek but there is a significant amount of pigmentation behind it so start small and build up if necessary. The color is the ultimate peachy glow that we all want for our cheeks but can't seem to find that right shade. Well here it is. A back-up will most certainly be necessary with this gem. Available at Space NK and Barneys. 4. mark. Touch & Glow Shimmer Cream Cube - Since my skin is not as oily during the colder months as the spring and summer, I like to wear a shimmer blush now and then. I recently received this mark Shimmer Cube and fell in love with the pattern and color before ever even trying it. It comes out quite pink on my cheeks which is nice when I want a brighter pop of color. However, the gold portion of the cube helps to balance it out nicely so it never looks too intense. Use a light hand with this however, because it can build up quickly. Available on the mark. website here. 5. Charlotte Tilbury Filmstar Bronze & Glow - I've been wearing this bronzer non-stop since I got it as either a cheek color or slight contour (though I am loving this palette as my regular contour staple). I don't wear the highlight each time I use the bronzer, but when occasionally I will dust along the cheekbones for a subtle glow. I need to use just the tiniest amount because it shows up immediately and is quite pigmented. For my everyday highlight, I have been using the Bobbi Brown finishing powder for almost a year now and swear by it. But when I want to take it up a notch, this Charlotte Tilbury fits the bill. Available at Nordstrom and Bergdorf Goodman. All of these are absolutely stunning shades - I love the variety. 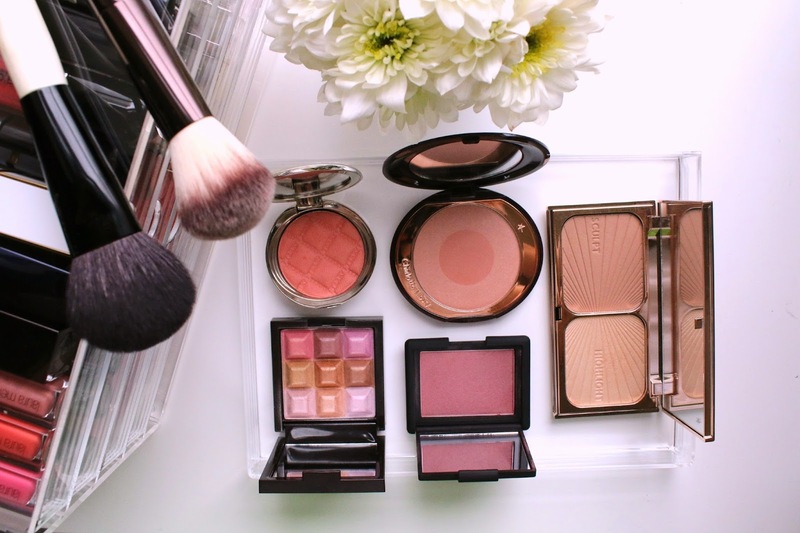 A good neutral blush is essential, it's perfect for when you have no idea what blush to wear! Platonic Blonde looks seriously gorgeous, and that formula sounds to die for!